Here’s my finish-line picture from Saturday. And actually, I don’t think I look all that bad. Sure, I was in a lot of pain at the time, but I’ve seen much worse. 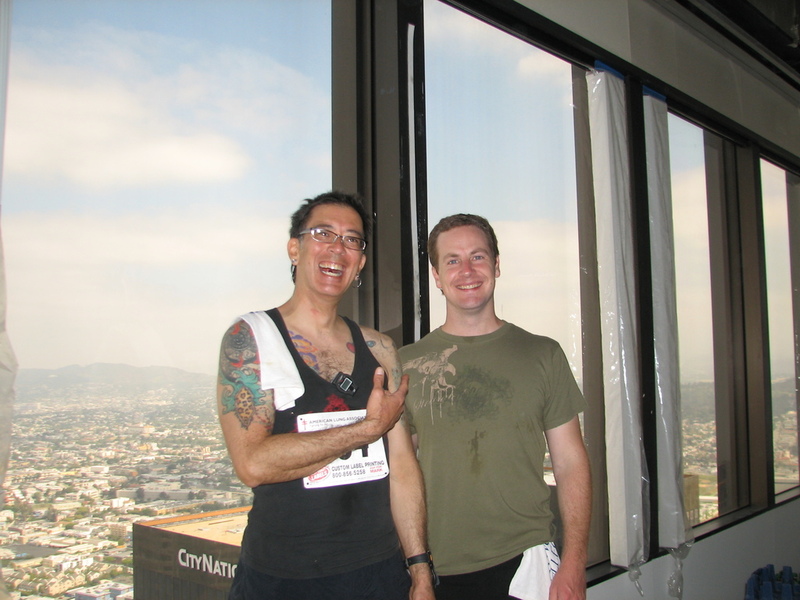 I talked with Erik, and we’re starting our planning for September and the U.S. Bank tower. You can see it behind me in the picture. Last year, I did it in 15:07, and we’ve set a goal for this year to go under 14 minutes. Between the three of them, they covered the decades from the ’50s all the way through the ’80s. It was a perfect spring day for riding. 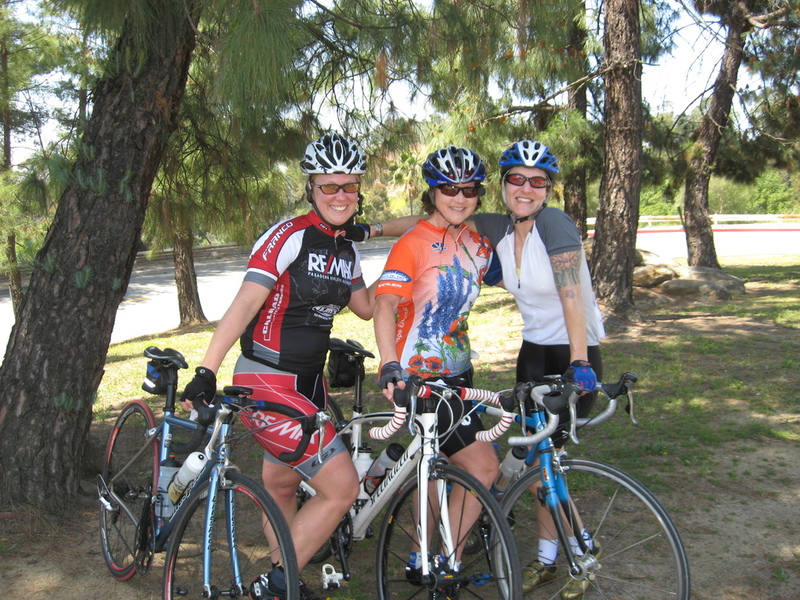 We headed out across Eagle Rock and then down, over the L.A. River, and into Hollywood. That’s where we saw Tinkerbell and some super-hero that I don’t recognize. Riding down Hollywood Boulevard is always an amusing and surreal experience. Continuing on, we took in a small part of the Sunset Strip, and then crossed into Beverly Hills. We saw the Menendez murder house and the Witch’s House. 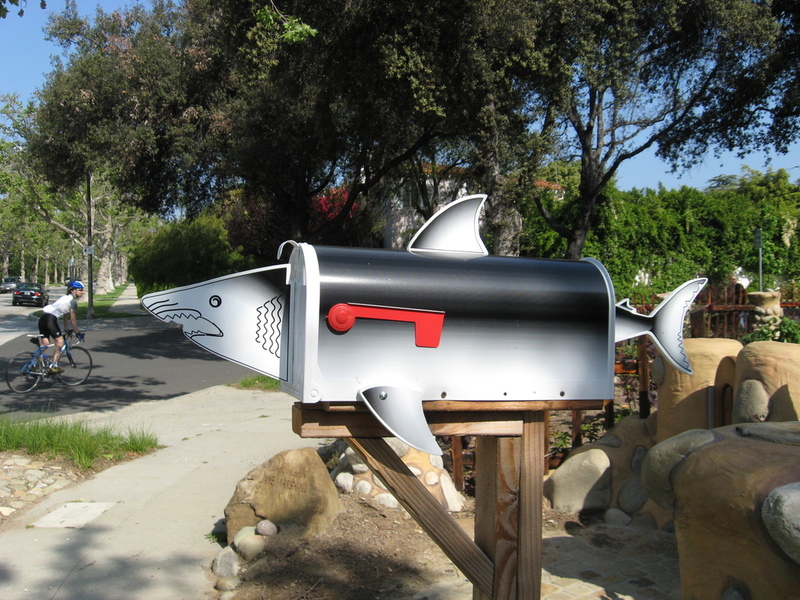 The Witch’s House was recently renovated and has a nice shark mailbox out front now. Leaving Beverly Hills, we passed Century City, where Silvio had another of his fancy carbon-fiber spokes break. This happened last month, too. 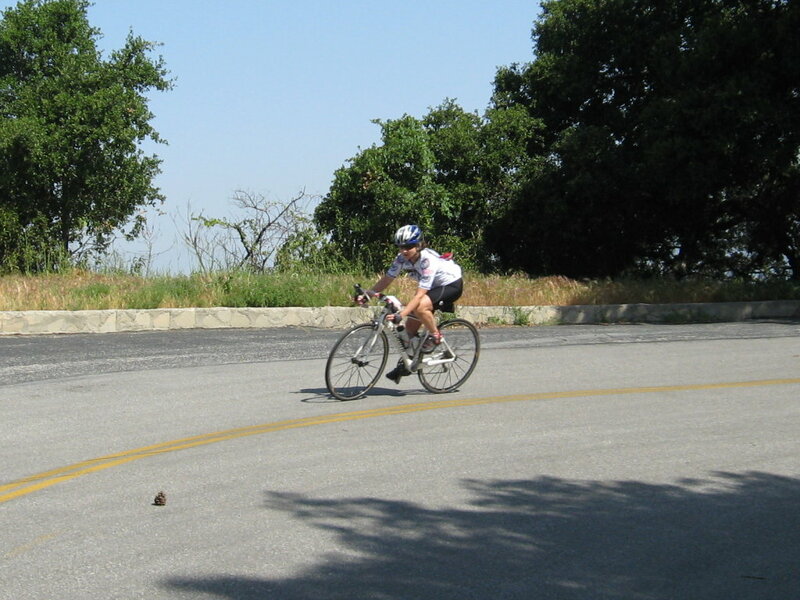 And again, the wheel went so far out of true that it was hitting the frame, rendering the bike unrideable. So he had to call home for help while we continued on our way. When we got to Westwood, we spent some time browsing around the cemetery. 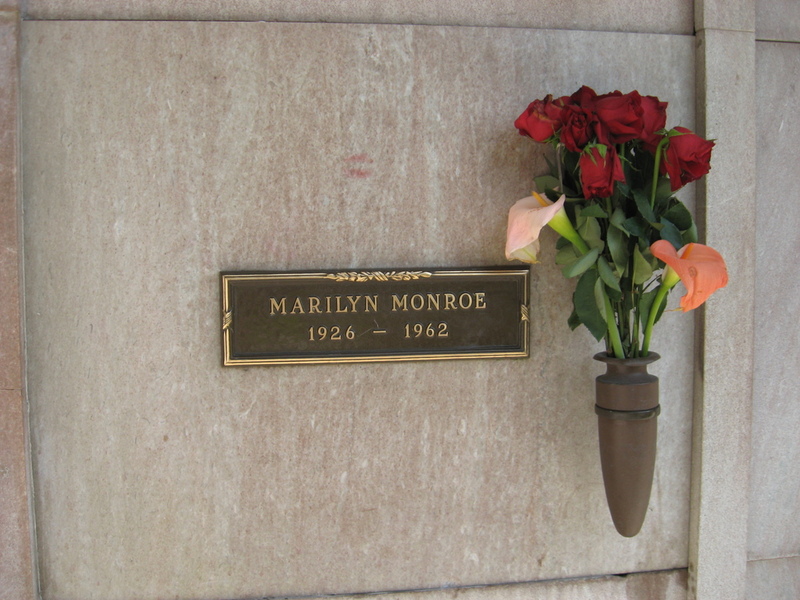 Marilyn’s crypt is easiest to find, since it’s well-marked and always has fresh flowers. 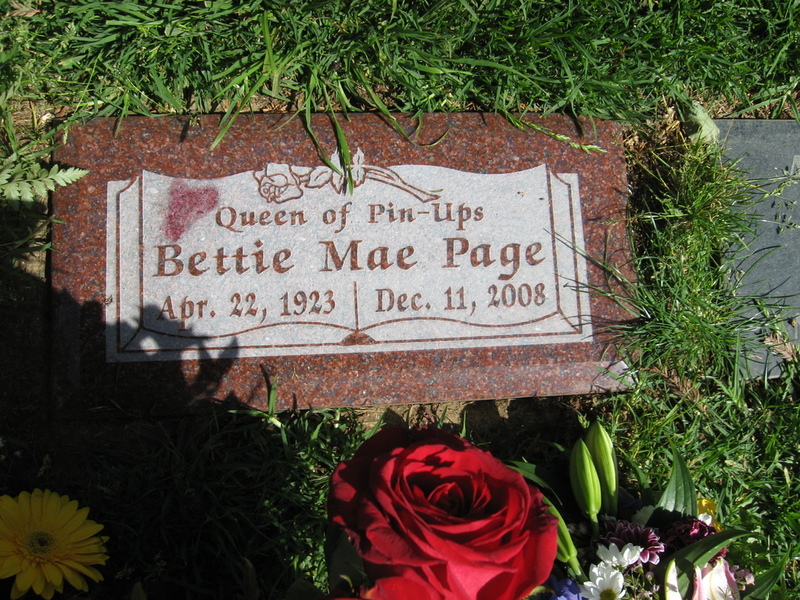 Bettie Page is buried in the grass nearby, and she also had some fresh flowers. 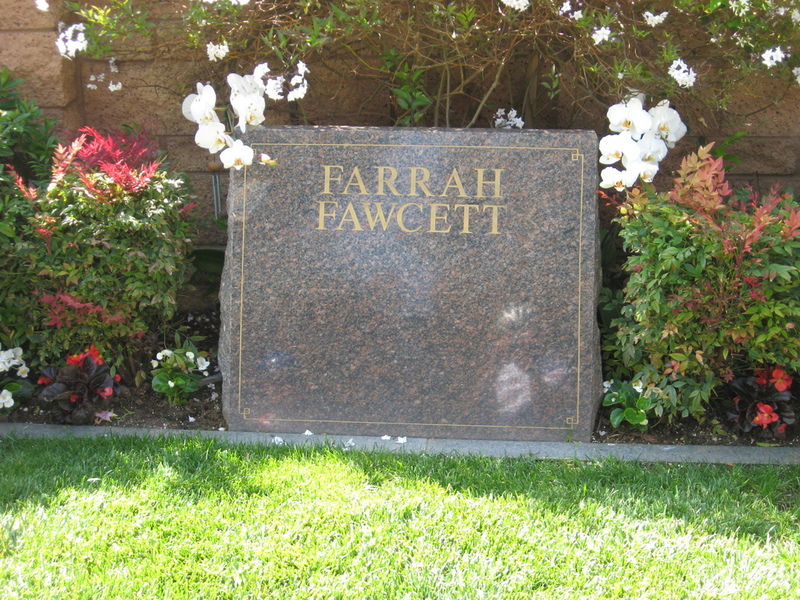 Farrah is on the other side in the small section with vertical headstones. It’s almost all very-famous people buried in that section. We looked around a bit more to see who else we could find. 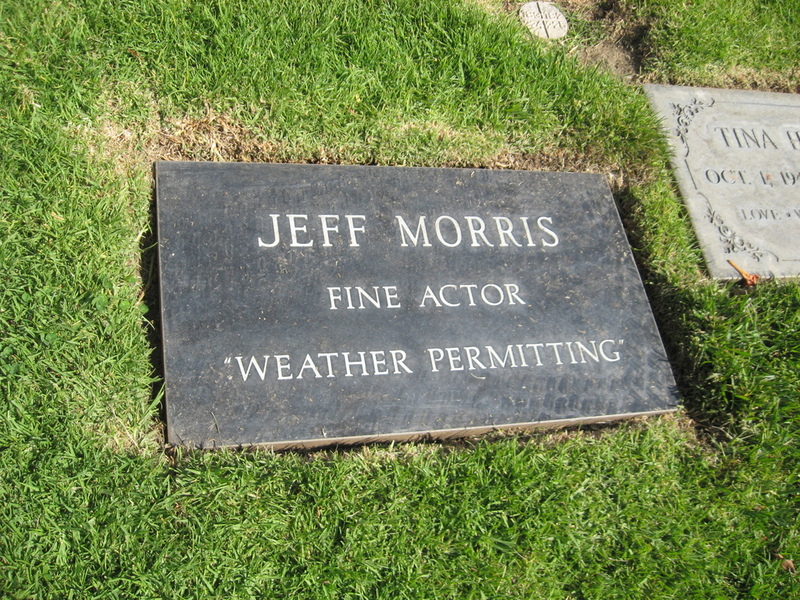 We liked the stone for Jeff Morris, although I had to look him up to remember who he was. I also made a point of showing Carla the spot where Frank Zappa is buried, since he has no marker. 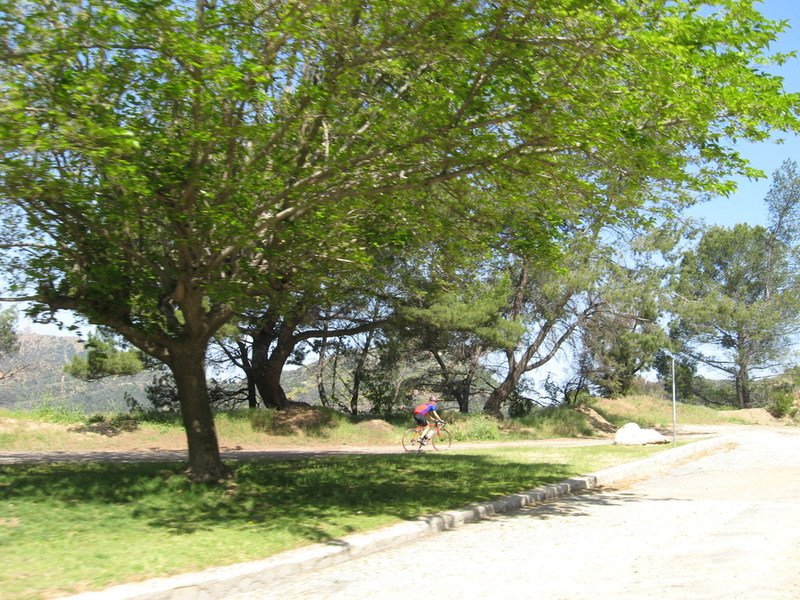 Leaving the cemetery, we stopped briefly at the little park in Holmby Hills before heading up Benedict Canyon. 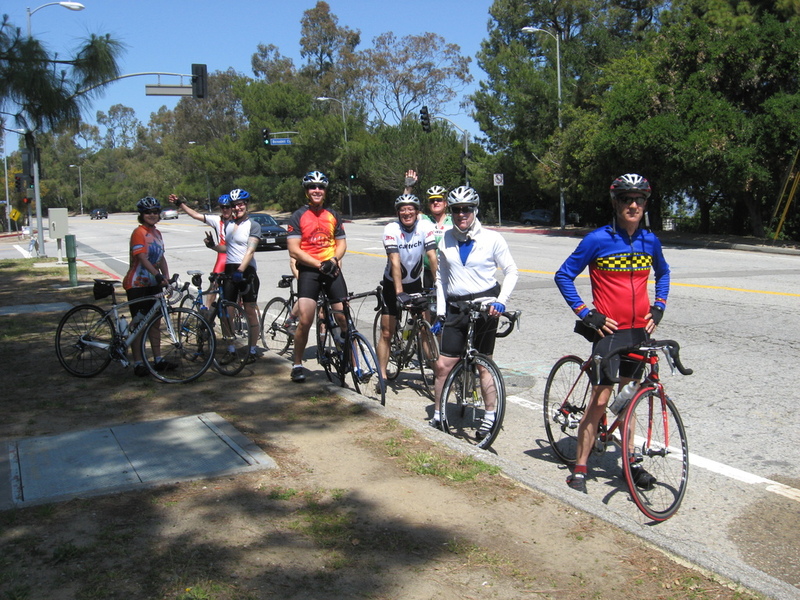 We regrouped at the top before going down the other side on Coldwater Canyon into the Valley. Our snack stop was at the little gelato place in Studio City where we’d stopped the day we went to see Michael Jackson’s house. From there, we headed straight home across Toluca Lake and Glendale. It was a very nice ride. This actually contains about equal portions of “Woo-Hoo!” and “Yikes!”. 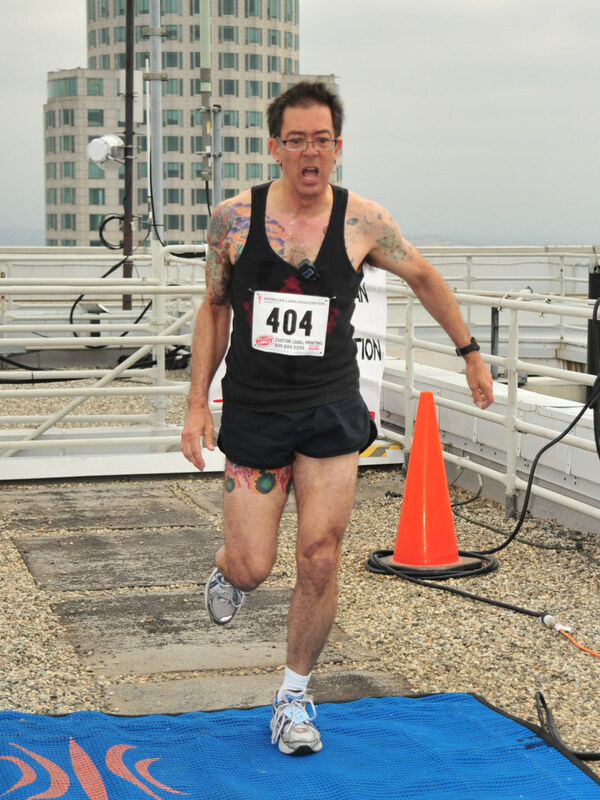 They published the starting wave times for the Aon Tower stair climb on Saturday. And they put me in the ‘Elite Men’ group that starts first. On the one hand, I’m happy that I’ll be running with the Big Dogs. But that also means that I may not be able to catch and pass anybody. And there is a very real possibility that I will be caught and passed. I’ve never been passed in one of these things before. There are about 60 of us in the ‘Elite’ group. And they plan on sending us all off in 15 minutes, which means that we’re going to be going at something like 15-second intervals. I’m guessing, based on my previous showings, that I’ll be somewhere in the middle of this group. But there’s a wide range. And it only takes the guy behind me being 15 seconds faster to make for my first time being passed on the stairs. On the other hand, maybe having guys passing me might be just the kick I need to go even faster. But I’m not convinced of that. 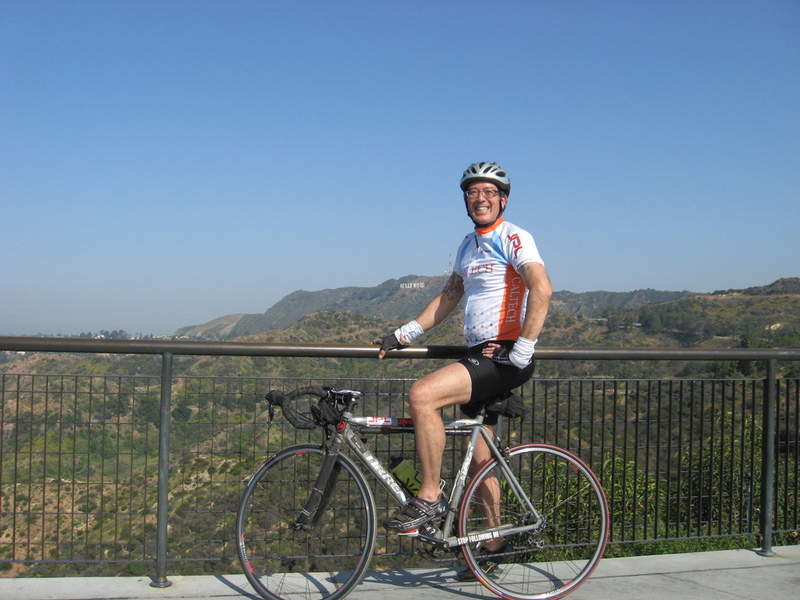 Today’s bike ride was the route out to Griffith Park to stop at The Trails in Fern Dell. It was a perfect spring day for riding. 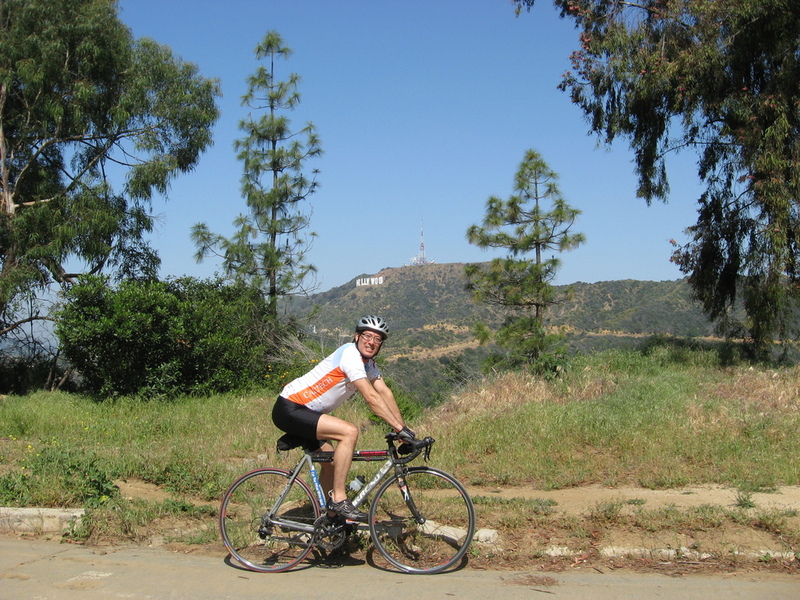 We rode out by the direct route, straight down the Colorado hill into Eagle Rock, and then down Eagle Rock Blvd, across the L.A. River and then up Vermont into Griffith Park. When we got to the observatory, we took a few minutes to look at the view. And then my phone started barking. It was Carla calling. She’d been a few minutes late to the park, and she’d been chasing us ever since. So John and I rode back down the hill to find her. Then we regrouped and headed down to the The Trails. 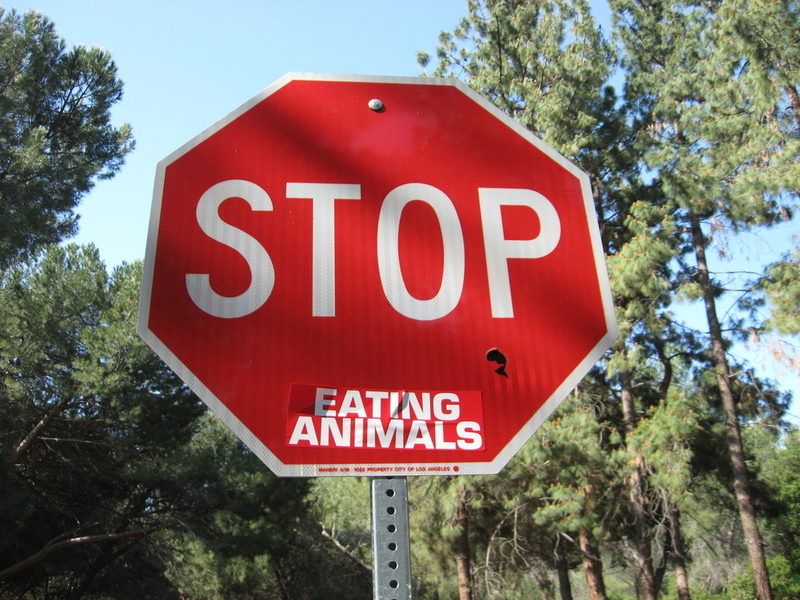 The sign outside exhorted us to “STOP Eating Animals”. But they’re made of meat. And oh so tasty. After our snack, which contained no tasty meat, by the way, we headed back up and over the hill to the Valley side of the park. John took a small shortcut along the way. Sure it was a dirt road, but it was a little bit shorter. Coming down the other side of the hill, I got some ‘action shots’ on one of the turns. 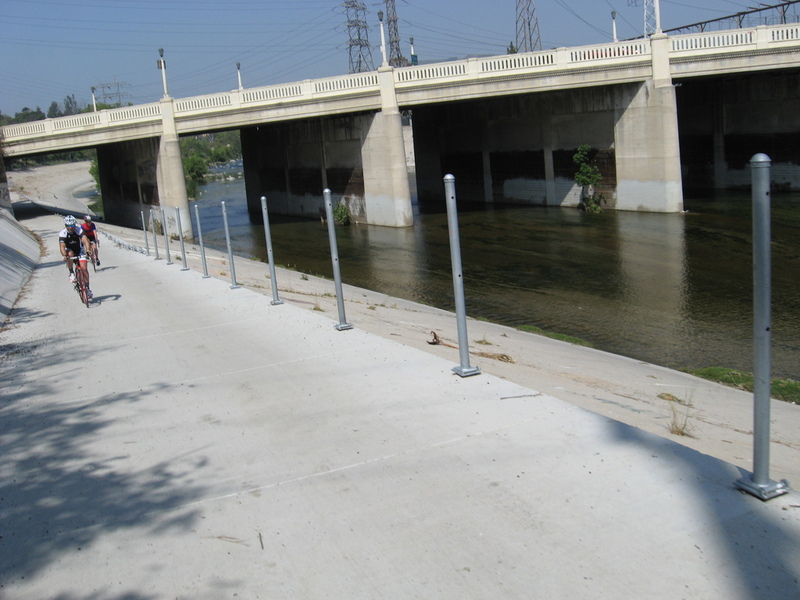 Then we rode down around Travel Town and got on the L.A. River bike path. They’ve been building an extension on this, and we saw some of it a couple weeks ago, so we decided to try it out. The new bike path is quite nice, and it goes all the way down to where the freeways cross the river, just above the Metro Gold Line yards. We got off and took Riverside across to Figueroa St. That was where we found a bunch of lottery ticket dispensers. It looked like someone had robbed a convenience store and stolen a bunch of lottery tickets. Doesn’t seem like a Solid Career Move, but it was still slightly amusing. We came back by way of Highland Park and South Pasadena. 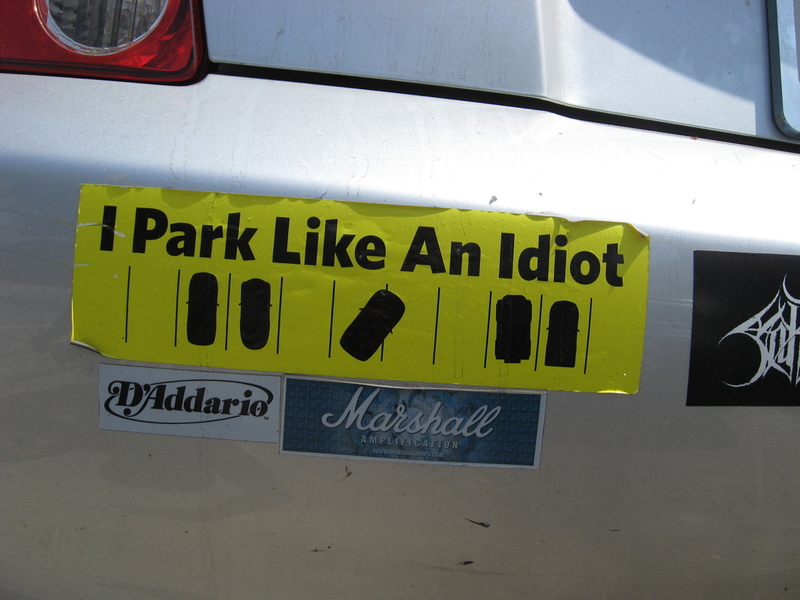 We passed Chicken Boy, and also a car with a bumper sticker that proudly proclaimed, “I Park Like An Idiot”. I guess we all have a special skill. It was a fun little ride. Lucinda is taking basic ice skating lessons. She said she wants to try speed skating. So I told her she needs to learn basic skating technique first. Once she’s comfortable on the ice, I’ll take her to one of the speed skating clubs here in L.A. They have skates available for kids to try, and I’ll dust off my speed skates, too. It would be fun to do it again. 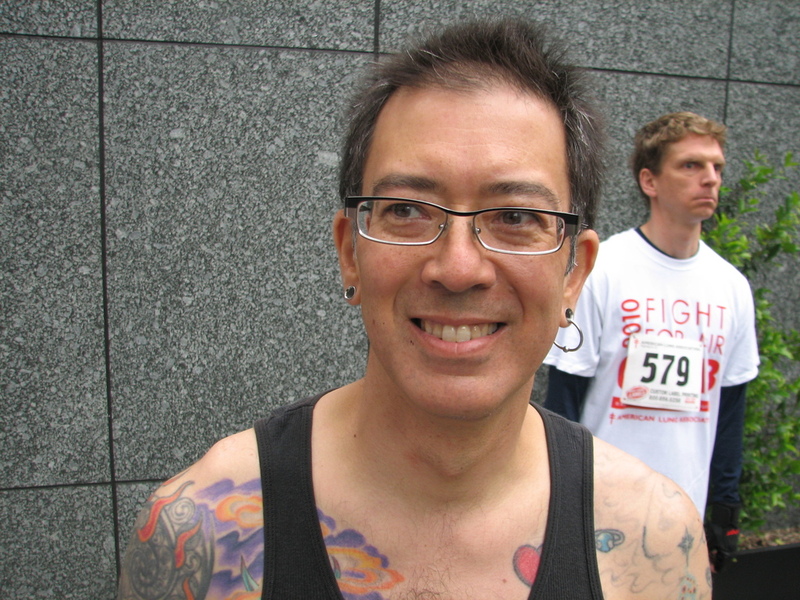 Back in my bike racing days, I used to skate with my other bike friends during the winter. It was fun, and it would be interesting to try it again, and possibly even to try competing. So this could be an interesting adventure. 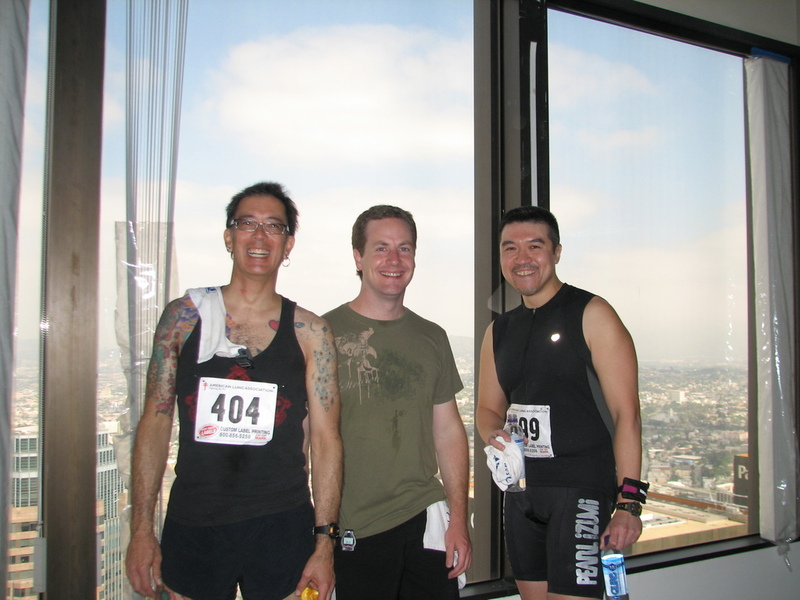 Today was the last practice run for the Aon Tower stair climb on the 24th. There was a good group there this time. I rode the train in from Pasadena, which makes going downtown really easy. I set my metronome for 75 beats per minute this time. This is 4% faster than my climb on Monday. I think I’ve about found my limit now. 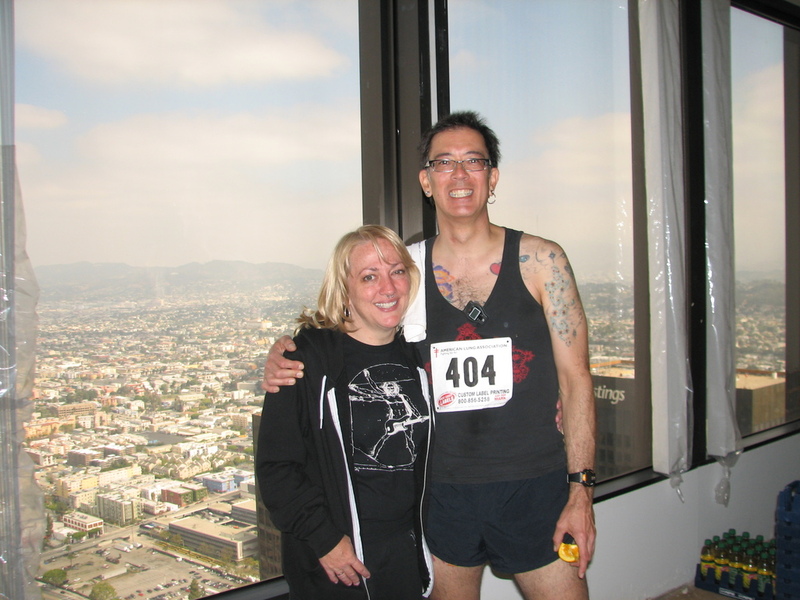 I was able to keep pace with it up to about the 45th floor. 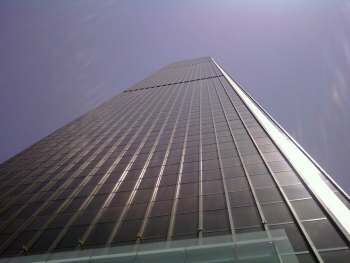 The last 15 up to the 60th floor were pretty painful. 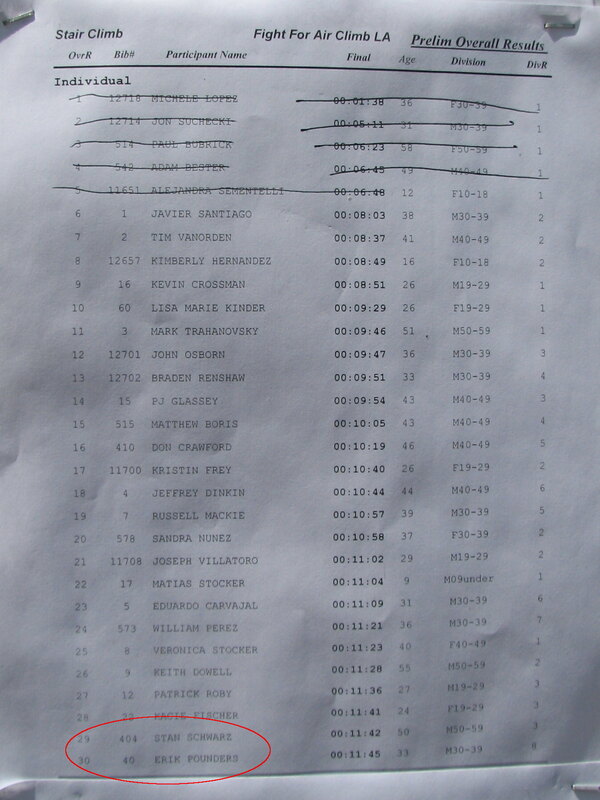 But I made it up in 10:28, which is my fastest time yet. So I think on race day I’m going to maybe set it for 74. Just back off a slight bit, since the real climb is six stories more than the practice. I guess this means I’m ready. This weeks is Spring Break for Pasadena schools. Apparently, this is later than all the other school districts in southern California. This worked out well for us, since it meant that this week was not in the blackout period for our friend Mike’s Disneyland pass. So yesterday we went down there and met up with him in front of the gates. He let us in with his pass and turned us loose as he headed back to work. We went to California Adventure first. We rode the Golden Zephyr, which was entertaining, since the wind was picking up, and it was close to the level of wind that would close that ride down. After that, we went on the Jellyfish ride, and then the Mulholland Madness roller coaster. We looked at the line for Toy Story Mania and decided it was too long. So we went and had lunch instead. Then it was time to go Soarin’. Now it was time for the Main Event. We walked across to Disneyland and headed straight for Space Mountain. The sign said the wait was about 20 minutes, so we stopped and picked up Fast Passes and then went to wait in the line. We rode the ride, and when we got out, we had only 15 minutes before we could use our passes to go back in. So we walked over to Star Tours, which had no line at all. We rode that and then went back to Space Mountain for a second time. Next, we walked over to Big Thunder Mountain. Again, we picked up Fast Passes and then waited in the not-very-long line. The ride was fun, as always. When we got out, we had about a half-hour before we could go back. So we went over to the Matterhorn and found it closed for maintenance. They said it would be open on Saturday, but that was too long to wait. Instead, we went back for some old favorites: Pirates and the Haunted Mansion. After that, we went back to Thunder Mountain and found it closed for repair. At this point, we needed to do something different, so we went to Toontown and rode the Go Coaster. This is a relatively tame ride now, but it was Lucinda’s first roller coaster. Then we went back to Tomorrowland so the girls could drive the cars at Autopia. But along the way, we stopped and picked up some more Fast Passes for Space Mountain. So after they finished driving we went back and rode for the third time. We went back and checked and found Thunder Mountain was open again, so we used our passes and rode it again. By that time, it was starting to get late. I said we had time for one more ride, and the girls said they wanted to ride Space Mountain again. So I told them we could go back there, pick up Fast Passes, and then they could do their gift shop time while we were waiting. They bought matching Mickey Mouse sweatshirts. Then we headed back for our fourth run on Space Mountain. When we got there, we had 15 minutes to go before we could use our passes. The sign said the wait was 15 minutes. So we waited in the line, rode for the fourth time, and then we walked around and used our passes to ride it a fifth time. That’s the most times on any one ride for us except for the day at Universal when we rode the Mummy eight times. On the way out, we stopped for the obligatory dinner at the Jazz Kitchen in Downtown Disney. This is my sentimental favorite, since I can line up all our pictures from there and see my journey through and climb out of Divorce Hell. It was a very fun day. Tiring, but fun. All the pictures are here. 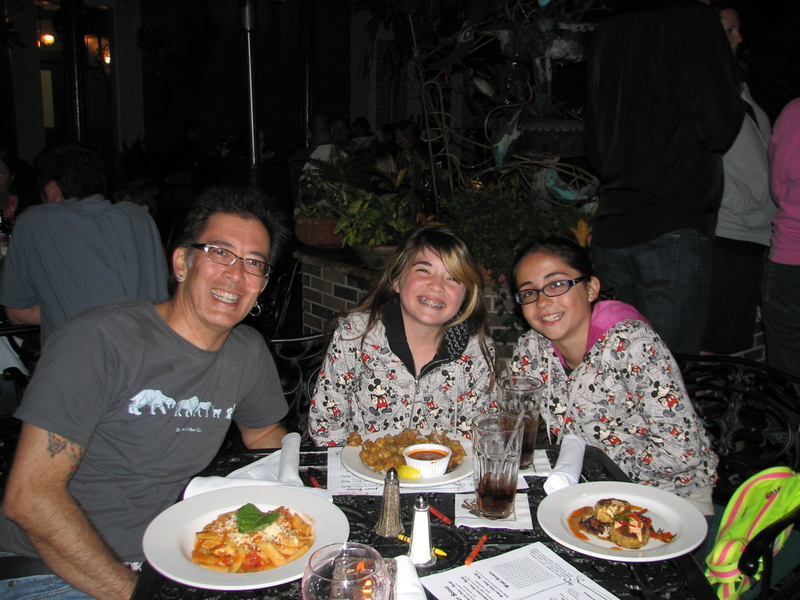 Every time I take Lucinda to Disneyland, we end the day with dinner at the Jazz Kitchen in Downtown Disney. The first time, it was because I just didn’t want to go home. It was right at the beginning of my divorce ordeal, and I was not well at all. Later, when things got better, we still went there to end our day, and I could see the progress. In each successive picture, I felt that I looked visibly happier. I know I felt happier each time. So here is the latest installment. Life is really quite good now. 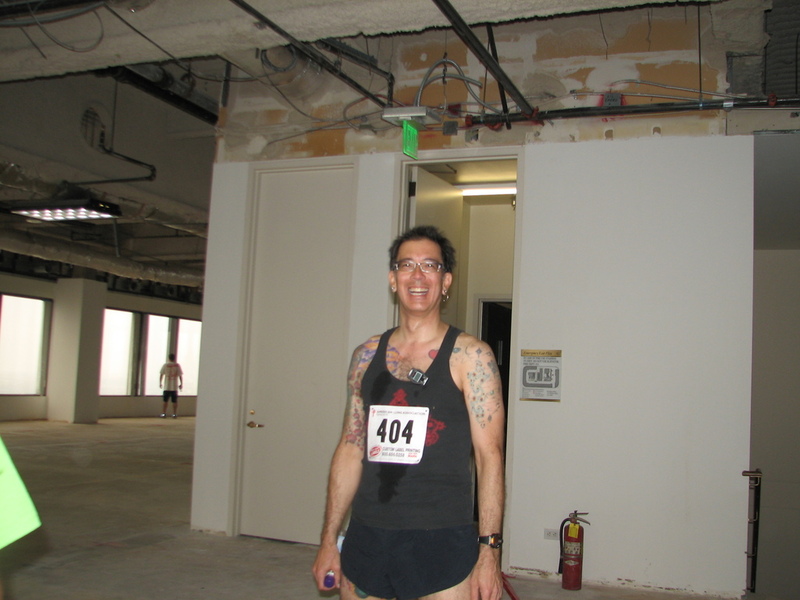 Today was the third practice day for the Aon Center stair climb a week from Saturday. Erik couldn’t go today, but I made time in my day to go do it. My quest is to do the tower in under 12 minutes, so today I put on my little electronic metronome and I set it for 72, which is 4% faster than the 69 beats per minute I had it set on last week. There were probably a bit over a dozen people there to do the climb today. I let about 10 people go ahead before I started. On the way up, I noticed that the turns on the landings took at least one and sometimes two beats of the metronome. If I assume an average of 1.5 beats per landing, that means I spent about 1.25 seconds on each landing, and that totals up to just a bit over two minutes total for the approximately 110 landings in the 56-story climb. That’s really a lot of time spent not climbing. 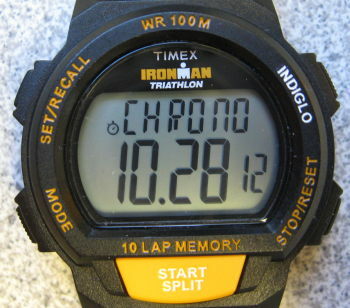 But sadly, 1.25 seconds rest really isn’t enough to recover in any significant way. 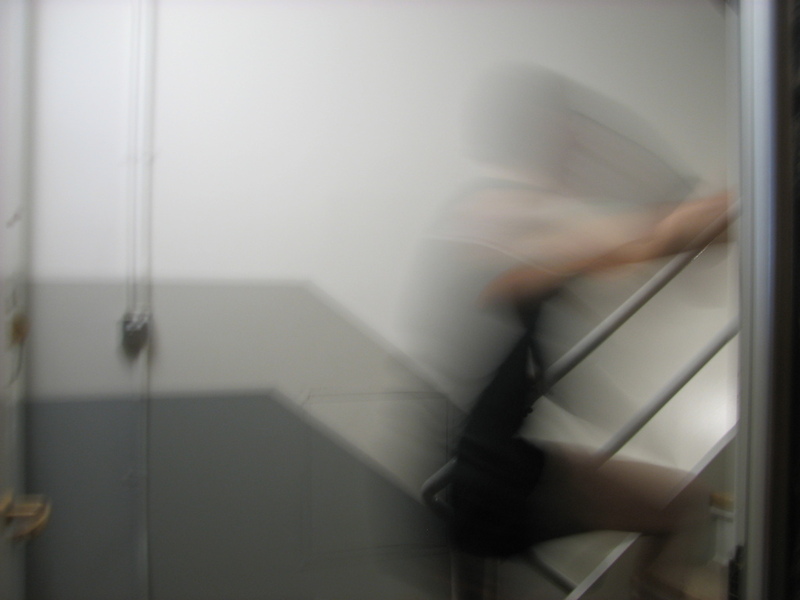 No matter how you slice it, climbing that many stairs hurts. Today’s climb felt like it was very close to my limit. 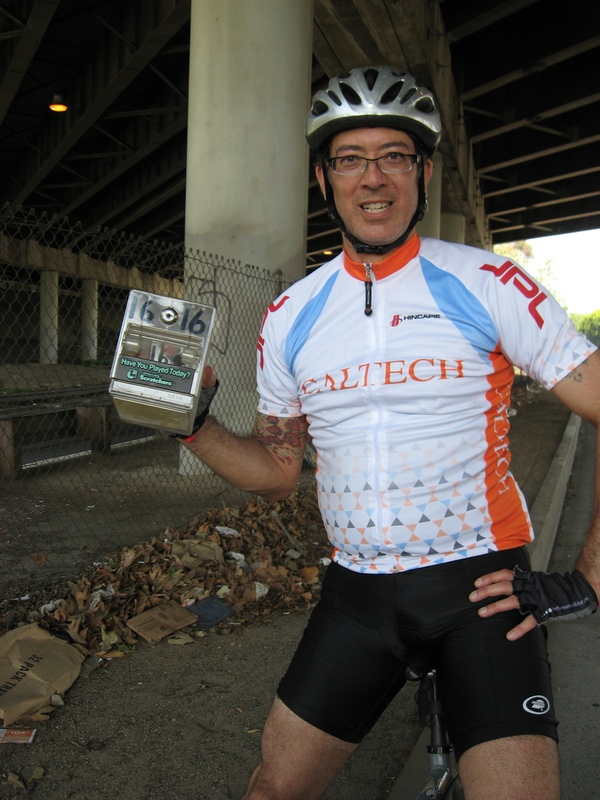 I just kept focused on the beeping of the metronome to keep pace. And I managed to keep the pace all the way up. But the last 10 stories were pretty grim. I passed all but one of the people who’d started in front of me, which was nice. 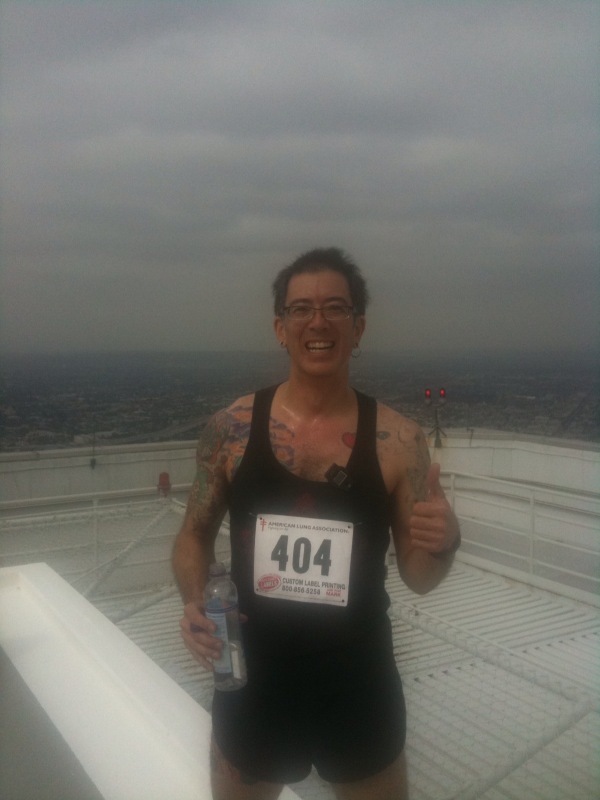 And my time at the top was 10:38, which I thought was quite good. Based on that, I should be able to do the full tower climb in about 11:45, which is well-within my goal of 12 minutes. So this is a Good Thing. I’m really enjoying this weird little sport I stumbled upon last year. It’s fun in a way that I can’t quite explain.